This past year I've discovered a fantastic world of parrots and witches, cannibals and zombies, pterodactyls and daemons. It has been a pure joy to bring this world to life with the Princess Tara Chronicles. These witches and characters and creatures have become part of my life. 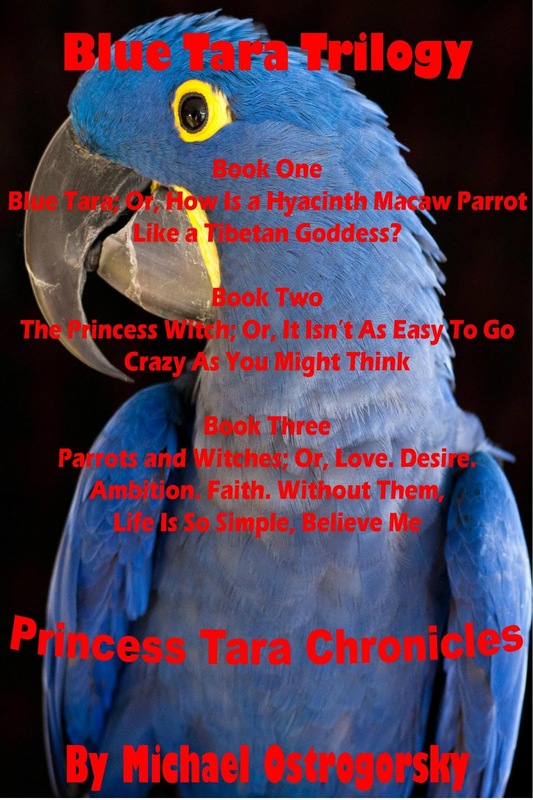 They have become as real to me as my hyacinth macaw parrot Princess Tara. Who really is a witch. I should know. I invite you to join me in my adventure as I bring this fantastic world to life in the continuing saga of the Princess Tara Chronicles. More parrots. More witches. More zombies. More pterodactyls. More coffee. I promise to make it worth your while! There was a complication. There’s always a complication. In this case, love. It was my experience from years of failure that complications always made love complicating. Regardless what the poets say, love is never simple. Or uncomplicated. At least that’s what I remember the poets saying. Some poets anyway. In my years of experience dealing with the futility of love I never experienced the novelty of a real live witch falling in love with me. Let alone two real live witches. The reason I found myself enmeshed with the coven of witches known as the Taras was because one particular Tara, Blue Tara specifically, bewitched me. Blue Tara is not just any Tara. I encountered her first as the brilliantly cobalt blue feathered hyacinth macaw parrot Princess Tara. Her real name is Ekajati, the mother of all the Taras. Twenty-one of them, as a matter of fact. Blue Tara first and foremost is a goddess. Or a witch. Take your pick of the word you’d like to use. It’s a semantical exercise basically meaning the same thing. Any being with the power to shape the world to its liking, to give life and take life, is a goddess and a witch. Manifested as Blue Tara, she appears as a six foot plus tall muscular Amazonian warrior. Amazonian not in the jungle sense but the Jason and the Argonauts sense. A warrior goddess. An Amazonian warrior with one pendulous breast and one piercing yellow eye. Jagged scars cutting across her chest and face where her second breast and second eye should have been bore testament to countless battles with the gods and demons of the underworld. Moreover, Blue Tara literally is blue. From toe to head. Except her hair. Her untamed vigorous short jet black hair gave her a wild aspect. The blue of Blue Tara is not just any old blue. Her crystalline blue skin glowed, muting the edges of her form, making her appear almost as an apparition. Except for her one piercing yellow eye. Her mesmerizing eye. Her one feature that stood out more than any other. Even when she stood totally naked. Which she always did when she manifested herself as Blue Tara. Her only adornment a huge steel battle axe slung from a belt around her waist. Going out in public with a tall muscular crystalline blue-skinned Amazonian warrior totally naked except for a battle axe could be a problem, even in the free-spirited city of Seattle. In public she typically manifested herself as an enormous brilliantly cobalt blue feathered hyacinth macaw parrot. A hyacinth macaw parrot with a huge black beak capable of wrenching your fingers off. A hyacinth macaw parrot with piercing black eyes set in rings of yellow on each side of her giant blue head. A hyacinth macaw parrot named Princess Tara. That’s how I discovered her at a dumpy little bird store below Seattle’s Pike Place Market, run by an old black guy named Charlie. The store appropriately called Charlie’s Bird Store. Truth be told, Princess Tara discovered me. I didn’t even have an interest in parrots at the time. But fate compelled me to walk through the door into Charlie’s Bird Store to meet this gigantic blue parrot. Somehow Charlie convinced me that getting myself a parrot would help me pick up chicks. And I don’t mean the poultry kind. But I didn’t pick out Princess Tara. Princess Tara picked me. Princess Tara needed me to rescue her from the bird store before she could rescue me and my world from a diabolically evil cannibal warlock and his zombie army of the dead. This was the complication. I already had a girlfriend. A girlfriend I loved. I had a parrot that I had fallen in love with. A parrot that I discovered just happened to be a witch. A witch with a coffee addiction. And a fondness for pizza and beer. And then there was the black witch, Kinqalatlala. It seemed when she wasn’t trying to kill me she was trying to make love to me. Like now.